New York — October 21, 2014 … Over 4,000 people attended a demonstration yesterday against the “Death of Klinghoffer” opera in New York City. Many were Jewish, some were Christian. All were angry. They all had one objective – to illustrate that this opera about a 69-year-old wheelchair-bound man, who was shot in the head by Palestinian terrorists on the Achille Lauro cruise ship in 1985 was an act of terror – not art. After hearing former New York Mayor Rudy Giuliani discuss the First Amendment and how it also applied to the protesters, listening to several other speeches by the organizers and local politicians, I walked over to the maze, gate secured entrance to look at the faces of those attending the opera. Standing at this new, makeshift, NYPD secured entrance to the New York Metropolitan Opera House were two protesters. One held a sign: “The Met glorifies terrorism” while the other held another sign: “Terrorism is not art”. Many of those arriving to see the premiere of The Death of Klinghoffer had no idea that there was a protest on this dark, chilly evening. They missed over a hundred wheelchairs with participants wearing signs from their necks “I am Leon Klinghoffer”, they missed the chants, they missed the speeches, they missed the anger, they missed the tears falling from the eyes of terror victims. A few were stopped by local and national media TV cameras for interviews. A few responded to the protesters greeting them. The ignorance could not be more transparent, blatant. And this was New York City. Yassar Arafat had ordered the murder of Jewish, businessman Leon Klinghoffer. This act of terror had nothing to do with an oppressed people. Nothing to do with human rights. But everything to do with furthering the goals of a very self centered and corrupt Palestine Liberation Organization. An organization which romanticized Palestinian terror, received millions of dollars in aid as such which then wound up in the personal bank account of Yasser Arafat and today keeps his wife Suha comfortable in the south of France. 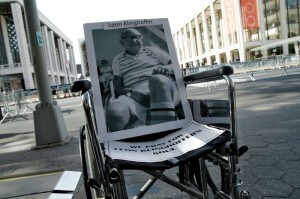 The daughters of Leon Klinghoffer had begged the Met to cancel the show. And the ADL appeared on CNN today stating that their comments truly summed up the entire situation. “The four terrorists responsible for his murder will be humanized by distinguished opera singers and given a back story, an ‘explanation’ for their brutal act of terror and violence. Opera-goers will see and hear a musical examination of terrorism, the Holocaust and Palestinian claims of dispossession — all in fewer than three hours,” said daughters Lisa and Ilsa Klinghoffer. “Our father was one of the first American victims of Middle Eastern terrorism. Today with the memory of 9/11, the reality of al-Qaida and ISIS, and countless other attacks and threats, Americans live under the deadly threat of terrorism each and every day. The Death of Klinghoffer protest organizers were many. They included AFSI, ZOA, JCC Watch, Mother’s Against Terrorism, Strength to Strength, and Stand With Us. They did a brilliant job coordinating this critical effort to educate the Met, New York and a global audience that one cannot use terrorism as an art form. But their work is far from finished. The Nazis used “culture” and “art” to soften up, confuse and eventually brainwash a very intelligent and sophisticated German nation. ISIS, Hamas, Al-Qaeda, Hezbollah, Qatar, Turkey and Islamic Jihad are today employing the same tactics. Their YouTube videos and social media campaigns are as professional as anything you will find in Hollywood. As thousands today are being slaughtered for being an Infidel – Christian, Shaitat, Kurd or Yazidis in Africa, Syria, Iraq, Iran and throughout the Muslim world, to hear a naive New Yorker say: “I’m not Jewish, it’s your problem” brings a tear to us all. You can’t fix a problem if you don’t know that there is a problem. One just has to ask the 13 million who perished in the Holocaust.